Never out of our minds! We've been quiet but the outrageous injustice suffered by the Cuban Five is never out of our minds. 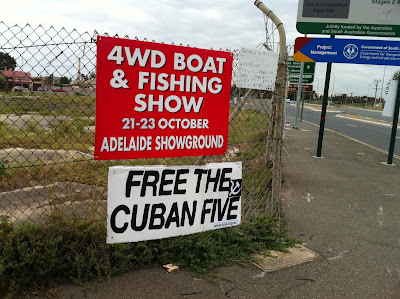 There's always something to remind us - like this freeway blog by the local Communist Party branch in Port Adelaide, South Australia. A few of these have popped up lately. "CASE closed — forget about that!" affirmed Ricardo Alarcón de Quesada, president of the National Assembly of People’s Power, referring to the unjust ruling of a panel of judges in Atlanta to uphold a decision to not review the appeals of Gerardo Hernández and René González. Speaking on the "Roundtable" TV and radio program, Alarcón said the ruling was objectively divisive in nature, in order to create confusion, but that the attitude of the Five continues and will continue to be one of unity. He recalled details of the rigged legal proceedings, which included substantial problems, false accusations, illegalities, prevaricating by judges in the different courts and administrative arbitrariness. "The U.S. government has not been able to provide any evidence to convict Gerardo; why, then, should the Supreme Court not take the case under review?" In the United States, the top court of justice is not obliged to review all the cases submitted for its consideration. According to statistics, it only reviews from 1 to 1.5% of cases submitted. "We have to prevent this case from being closed," Alarcón emphasized. "We are going to reopen it with arguments, with concerts, with exhibitions, mobilizations, filings before the court, with our hands, teeth and nails, but we are definitely going to open it, we will open it." He announced that a group of lawyers is preparing to present the case in the U.S. Supreme Court, accompanied by mobilizations, denunciations and international solidarity, which continues to grow. 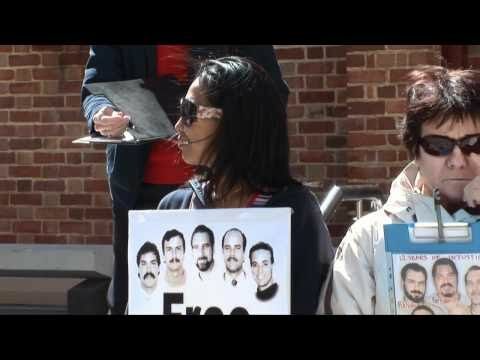 That was touched on by Rosa Aurora, Fernando’s wife, and attorney Nuris Piñeiro who, in India witnessed many actions of support for the cause of freeing the Cuban Five, and for visas to be granted to Olga Salanueva and Adriana Pérez so that they can visit their husbands René and Gerardo. Piñeiro said that those actions show how the Five are international symbols of dignity and respect for peace. Alarcón also noted that an environment is slowly being created in the United States that is forcing judges to reconsider and the government to act. On that point, he said, "I think there is total consensus in that country: change, and that change is going to be produced by the masses, the people. Likewise, there has to be a change in the case of the Five, and we’re going to achieve it." We arrive at the 10th anniversary of the arrest of the Cuban Five at a crucial moment of our legal process (That is what they call it, although perhaps “illegal process” would be more appropriate.) The 11th Circuit Court of Appeals, based in Atlanta, has just ended our appeal. That is to say, if it were up to them, things would stand as is, and some day my bones would be sent to Cuba, after death frees me from two life sentences. The court in question has given unmistakable signals of the type of “justice” that the Five can aspire to in this country. When there was a decision 3-to-0 in our favor, with 93 pages of solid arguments in which the three-judge panel characterized our trial as “The Perfect Storm,” the full panel, against all predictions, not only agreed to review the decision, but reversed it without much explanation. The “perfect storm” quickly became simply a drizzle. Yet, this time, when the decision was 2-1 against the Five, with obvious legal errors, with a judge arguing in 16 pages that the prosecution presented absolutely no proof that sustains the charge of conspiracy to commit murder, and with a judge who—although voting against us—recognized that it is a “very close case,” and with several defense arguments were not even seriously analyzed, the 11th Circuit categorically refused to review it. As we say in Cuba: “Not even water is as clear.” We have said time and again that this is a political case, and those who do not see it as such, choose not to see it. Someone recently mentioned that now the Supreme Court has the last word. I would say, the second-to-last word. The final word in the case of the Cuban Five rests with you, our sisters and brothers of Cuba, the United States and the whole world, who throughout all these years have been our principal source of encouragement. Our hopes are not placed in any court. Ten years are more than enough to have cured us of any such naïve notion. You are our hope, who through sacrifice and swimming against the current, have succeeded in making people on all continents aware of the injustice committed against the Five. You are the ones who are not taking time out or resting in your homes but instead are honoring us with your presence in different activities, commemorating the 10th anniversary of our imprisonment. You continue struggling to unmask the double standard of a government that invades other countries to supposedly fight terrorism, at the same time that it harbors and protects infamous terrorists, and imprisons those who are trying to stop those criminal acts. We have confidence in you to expose the hypocrisy of the corporate media and of certain international organizations, which portray mercenaries—who betray our people for a handful of dollars or a visa—as suffering political prisoners. Yet they are disgracefully silent in the case of two women who have been deprived for a decade of the basic right to visit their husbands in prison. We know that right is on our side, but to win true justice we need a jury of millions of people throughout the world, and we need you, defenders of just causes, to make our truth known. The injustice committed against the Five has kept us away from our homeland for ten years, but it has not kept us from accompanying our people through joyful times and also the suffering. A few days ago Hurricane Gustav caused great damage in Cuba, mainly on the Isle of Youth and in Pinar del Río, two territories from where we have received a multitude of support and love all these years. We are certain that all the people of Pinar del Río and Isle of Youth, together with local and national leadership, with the solidarity of all dignified Cubans and many friends of the world, will become stronger in these difficult moments and—as is characteristic of revolutionaries—will convert the setbacks into victory. Although it is not possible for us to be there physically, today more than ever the Cuban Five are with you in our hearts, with our brothers and sisters in the Isle of Youth and Pinar del Río, who have done so much to support the struggle for our liberation. Compañeras y compañeros: Ten years after that September 12, 1998, we thank you once again for walking this long and rough road together with us. We know, that to continue this march, we can keep counting on you, and you can also always count on our firm determination to resist, with our heads held high, for as long as it takes. Leonard Weinglass, Defense Attorney for the five Cuban antiterrorist fighters held in US jails for 10 years now, known as the Cuban Five, spoke with the Cuban News Agency during the launching, September 20 in Havana, of the book “Chronicle of an Injustice,” which describes the case; the book is one more effort to raise world awareness about the cause of five Cubans who were given extremely long sentences for having fought terrorism. We now bring our readers the full text of the conversation with the US lawyer. Mr. Weinglass, the 11 Circuit of Atlanta’s Court of Appeals recently rejected a petition made last June 24 by the defense to review the case and reconsider its decision, upheld the convictions. Could you tell us what comes next in the legal battle in favor of the Five? However, we understand that the Supreme Court only takes from 1.5 two 2 percent of the case that are presented each year. What are the chances for this case, then? As to legal cases you have reiterated your statement that you do not win in court but on the streets, we understand that public support is crucial. Why is this a political case? -- “These case takes every definition of a political trial, and it is a case that involves not just a political issue but also the relationship between the US and Cuba. In the trial process they reviewed the 40-year history of that relationship, and this case is centered in that history. So it is unavoidable of the process itself that the process itself has been political since the beginning and it remains political. Senator McCain, currently running for President referred to our case, so it is a political case; if it will be decided politically it requires political support. The presentation of the book, which was printed in Spanish, English and French, was made by the president of the Cuban Parliament Ricardo Alarcon at the colonial building hosting the Cuban Book Institute, in the old section of Havana. The ceremony was attended by relatives of the Cuban Five, the president of the Havana-based Casa de Las Americas Institution, Roberto Fernandez Retamar and other personalities. Gerardo Hernandez, Ramon Labañino, Rene Gonzalez, Fernando Gonzalez and Antonio Guerrero, were framed and arrested by FBI agents in 1998 and given unfair and long sentences including four life terms, after they collected information on Florida-based ultra-right organizations that have undertaken terrorist actions against the Cuban people.